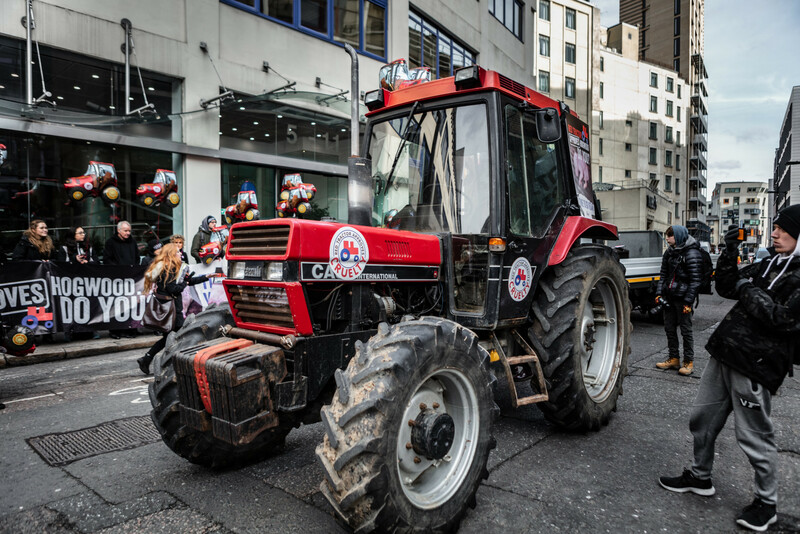 Viva!’s Red Tractor Action a HUGE Success in London! | Viva! 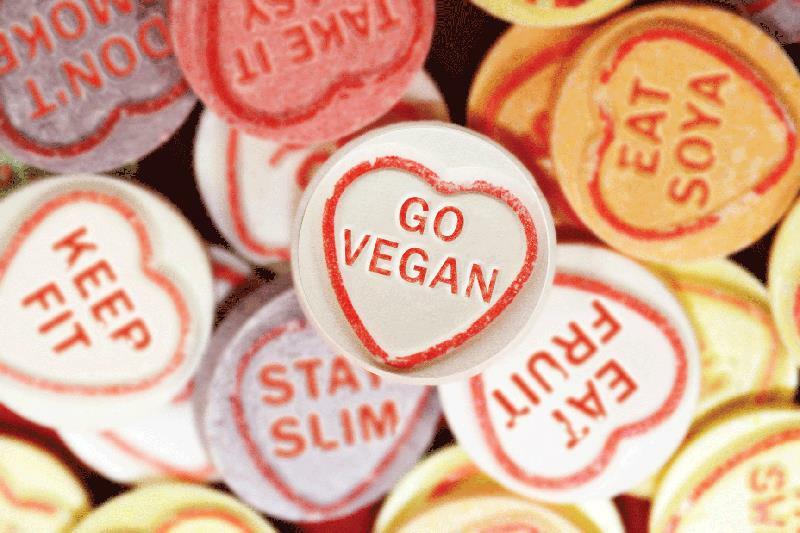 On 2 January 2019, Channel 4 Dispatches aired a documentary called ‘The Truth About Vegans’. 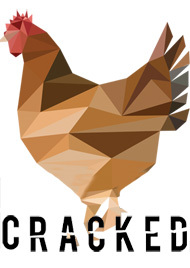 In this documentary, Dispatches focused on Viva!’s investigation of Hogwood Farm. Hogwood is just one example of how a mega pig farm - supplying Tesco and carrying the Red Tractor seal of approval - treats animals. 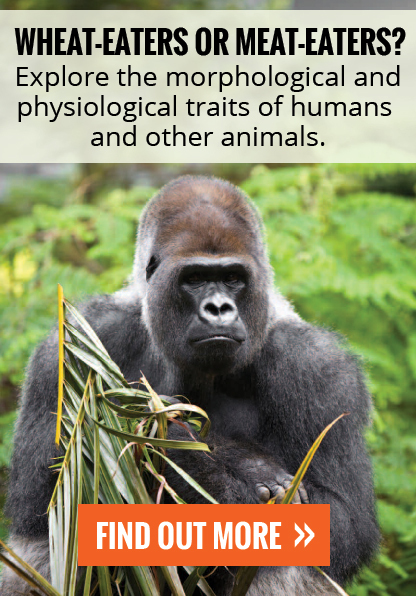 Red Tractor are well known for approving appallingly low standards of animal welfare. But it is not just Red Tractor that approves pig cruelty - Tesco does too! Despite Viva! recording severe overcrowding, pigs covered in excreta, barren, filthy conditions, animals abandoned to die, cannibalism of corpses left to rot among the living, and decaying piglets engulfed in a sea of writhing maggots, Tesco have continued to use Hogwood Farm as a supplier! And so, in response to Dispatches, we did not just make a statement, we went one further! 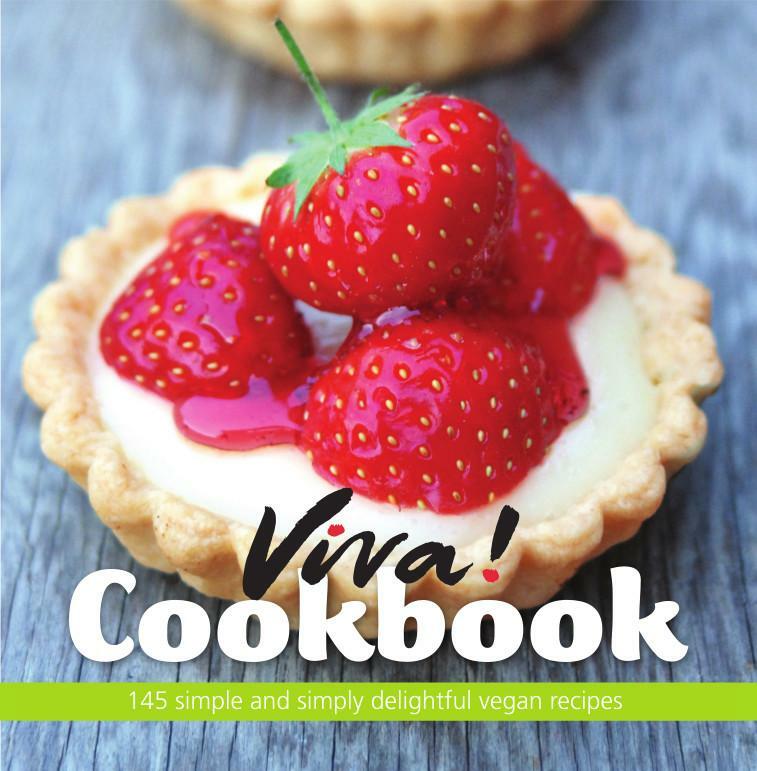 On Friday 18 January 2019 Viva!’s campaigns team travelled to central London to host a photocall outside the Red Tractor Head Office followed by a successful outreach event at a large Tesco store on Trafalgar Square. At the photocall, we used large, stunning placards and an 8 meter banner so that nobody was unaware of our presence! Also recyclable balloons. 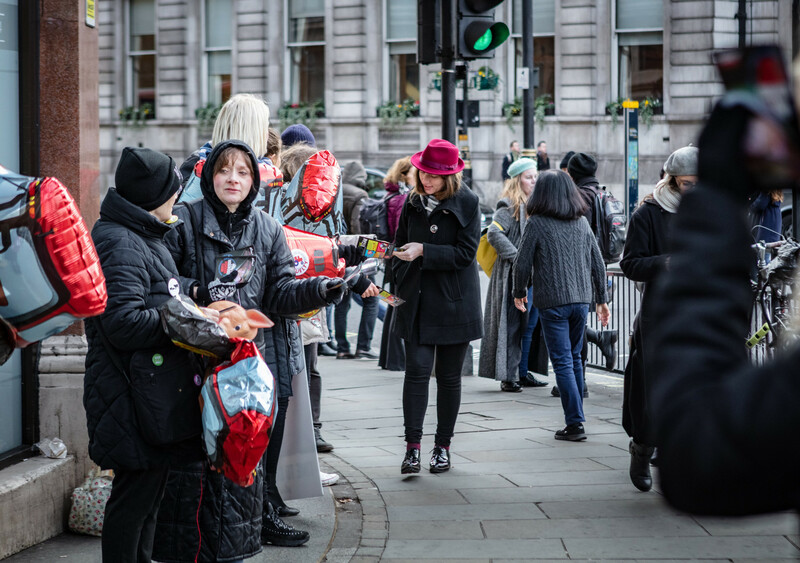 We are so thankful to the 50 activists who came along to show their support for Viva!’s campaign and, because of them, hundreds of leaflets were handed out on the day at the outreach event. 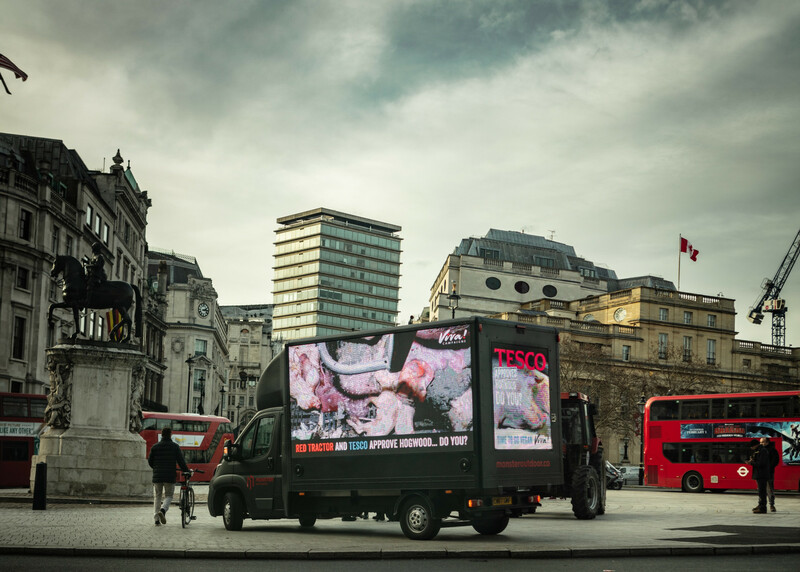 Following on from the photocall, the tractor and video van followed us on to our next destination – Tesco on Trafalgar Square. There we handed out leaflets in front of the video van which stationed itself on the edge of Trafalgar Square, opposite Tesco. 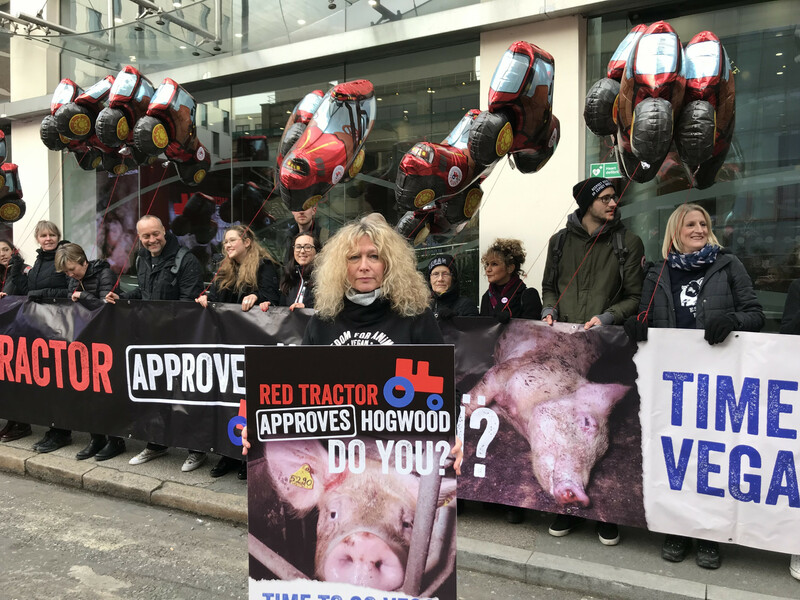 The large banner was wrapped around the busy Tesco window front and activists held positive conversations with the passing public – many of whom were shocked to see Viva!’s leaflets on Hogwood Farm, and to learn that Tesco has not acted on Viva! 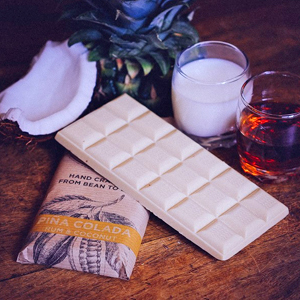 's findings. 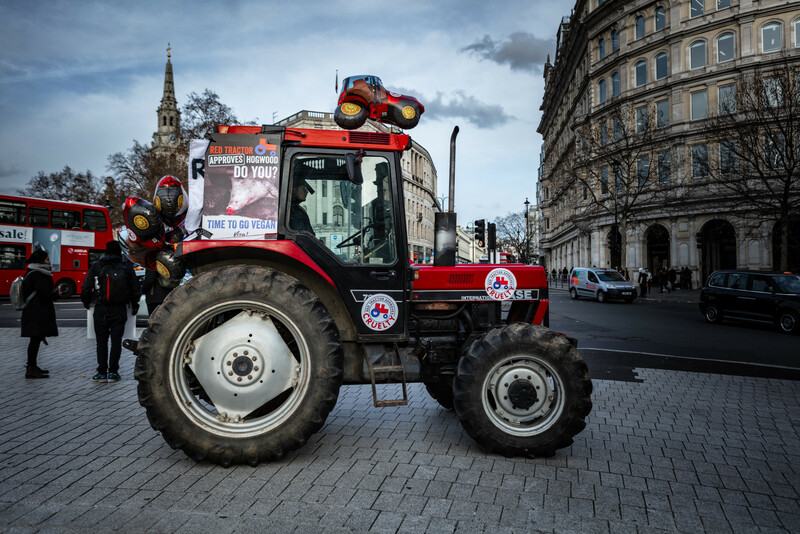 While the outreach took place, our red tractor proceeded to parade the London streets, stopping off at iconic land marks such as Big Ben and Westminster Bridge, as well as the London office of DEFRA. 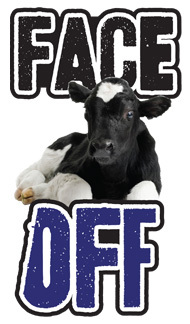 Red Tractor is nothing more than a clever marketing tactic employed by the animal agriculture industry. They require little more than the UK and EU legal minimums, and still allow cruel practices such as tail docking, teeth clipping and farrowing crates to take place. 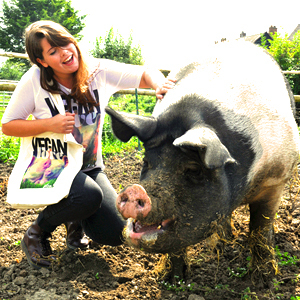 Hogwood Farm is approved by Red Tractor, and Tesco continue to be supplied by Hogwood Farm. Consumers have a right to know this and Viva! will continue to inform the public about these connections, and remind consumers that they cannot trust the tractor or Tesco. The only way to end the suffering is to go vegan.